The vintage style has been popping up just about everywhere these past few seasons. Tops, dresses, and jumpsuits have been coming out with cute wooden button details which I have been loving. The best part is, you can find this look just about anywhere now and you don't have to pay a ton to get the vintage look. Of course, going to a thrift store would be your best bet on finding authentic vintage pieces. But, if you're looking for items that are more modern but have a vintage feel then this would be the perfect look for you. I found this adorable jumpsuit at Papaya, yes Papaya! I haven't shopped at this store since I was in high school but they are making a great comeback. This jumpsuit was $25 and it reminded me of something you would find at Reformation or Free People but for a fraction of the price. I wanted to dress up this jumpsuit, so I decided to wear these red boots with it and black accessories. I purchased this cabby hat last Fall and it is still going strong this year as well. Cabby hats also give a quirky and vintage vibe to an outfit and they can be found just about anywhere these days. This outfit would be perfect for a fancier Thanksgiving party which is where I wore it to. To make it more evening appropriate, I wore my black Tory Burch cross-body and my gold watch. I also wore dark red lips to match the rest of my look. This has definitely been one of my favorite Fall looks this year so far. T'is the season of comfy sweaters! Fall is my favorite season just for this reason because I get to cuddle up in big chunky sweaters and cardigans and basically feel like i'm in pj's everyday. This year, sweaters have been coming out in all shapes, colors, and fabrics. My favorite type this year have been chenille sweaters. Chenille is a gorgeous soft and velvet feeling fabric that gives sweaters a luxurious look. The best thing is, chenille sweaters are available at a ton of different places for very affordable prices. The one that I'm wearing here is from Charlotte Russe and it's only $25. 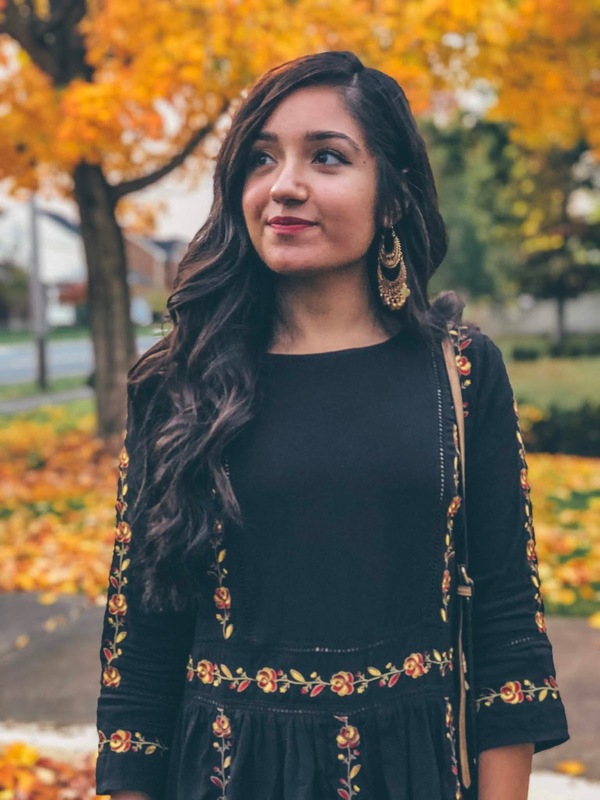 I've been shopping at Charlotte Russe ever since I was 13 years old and I love all the trendy items that they have for such affordable prices. This sweater also comes in a ton of different colors but I decided to go with this burnt orange color for the Fall season. This outfit is also the perfect look for a casual Thanksgiving dinner because the black booties help to dress up the look. Also, instead of wearing a light lip color you can opt for a darker burgundy to be a bit more festive. 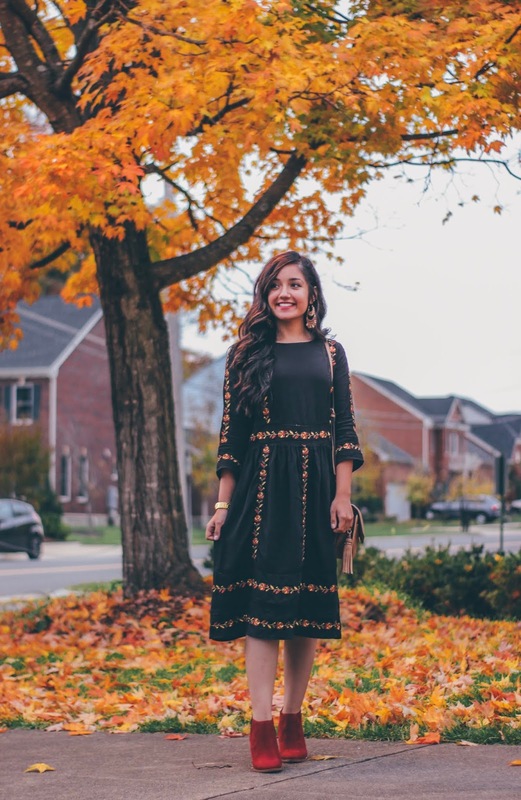 Thank you to Charlotte Russe for helping me create this fun post! The leaves have finally started to change color and it’s really been inspiring my fashion again! Statement boots have been a huge trend this season and I have purchased a few of my own, including these red ones. You’d think red boots may be hard to style, but I’ve been able to pair them with a ton of different looks and they always make an outfit pop. 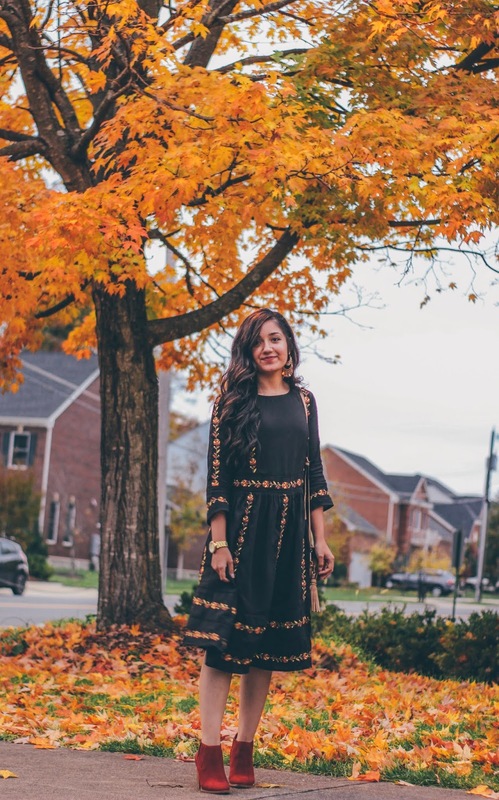 For this look, I decided to wear this boho styled midi dress from Forever 21 which has some floral embroidery details on it, including some red flowers. 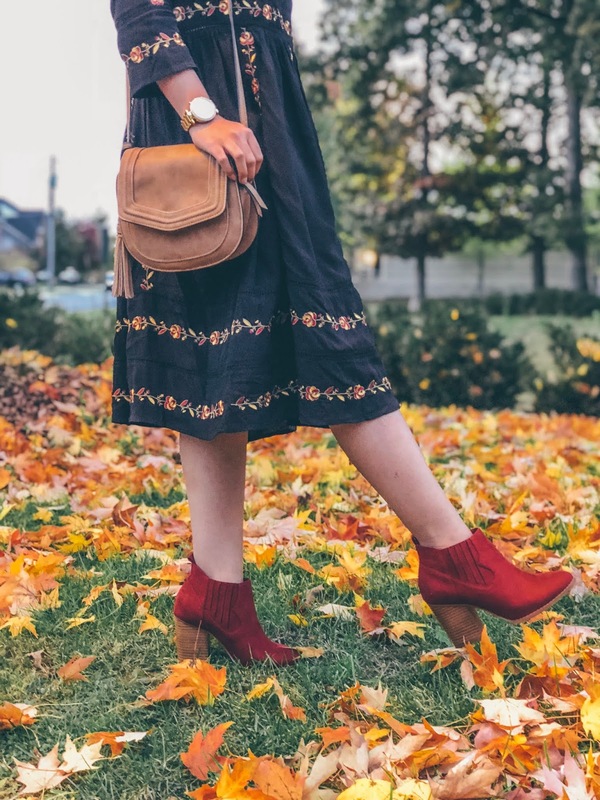 I thought this dress looked a lot like something you would find at Free People which is why I love it so much, I have been finding many Free People dupes at Forever 21 lately and this is especially great for people who want to go for the bohemian look, but can't always pay the Free People price tag.